Villa Padma certainly checks off all the right boxes. The lavish four bedroom vacation home overlooks a scenic landscape made up of rugged mountains and the ocean. Its interiors are magazine-worthy; as you flit from room to room, you’ll set sight on state of the art amenities set alongside elaborate furnishings, hand-carved ornaments and contemporary artwork. And while the home is nestled away within an exclusive gated community in Cape Yamu, you’re never too far from the action, and are within easy reach to top-notch dining venues and local amenities. Villa Padma accommodates eight guests in four bedrooms. All rooms are thoughtfully furnished to facilitate rest and relaxation; each features block out curtains, plush king beds and quality linen. Slat patio doors and full-length glass windows bring the outdoors in. With Wi-Fi access and a workspace, you’ll get to catch up on urgent work matters if required. And last but not least comes the highlight of the bedroom - a generously proportioned en suite complete with twin vanities and a shower alcove or standalone soaking tub. 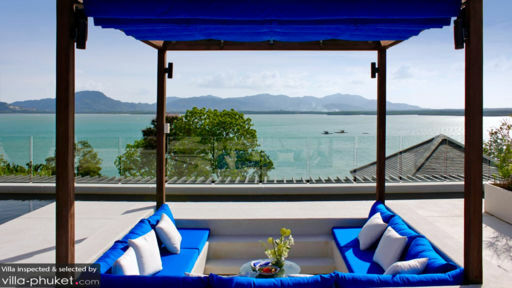 Villa Padma offers multiple outdoor spaces for sunbathing, dining and relaxation. Enjoy a swim in an infinity pool overlooking the ocean, before drying off upon a sun recliner. Next to the pool lies a BBQ pavilion equipped with a wet bar, fridge and washroom. It provides the ideal setup for waterfront dining; you’ll enjoy uninterrupted sea views and cooling ocean breezes. Upstairs, there’s a roof terrace complete with outdoor seating and a sunken sala - just perfect if you’re looking to enjoy a round of cocktails at sunset. Each of the living spaces at Villa Padma enjoy sea views and are lavishly furnished, featuring modern pieces, ornate home accessories and state of the art amenities. Lofty ceilings create a sense of spaciousness within, and the expansive glass windows and bi-folding doors allow ample sunlight to pour in. The villa’s fully equipped open kitchen has all the appliances required for your personal chef to whip up a scrumptious meal (kids menus are available too). The adjoining dining area comfortably accommodates eight, and offers a more casual setting. A wood-panelled dining area complete with vaulted ceilings, ox-bone chandeliers and hand-crafted sculptures offers a more formal dining experience. Catch up with friends and family in the games room (it comes equipped with a pool table and foosball set), or enjoy a movie marathon in the screening room. The latter features a 120” projector screen and surround sound system. Airport transfer, housekeeping services, security service, as well as the use of a baby cot and high chair are available free of charge. Amenities available at additional cost include car rental, personal chef service, daily breakfast service, laundry service and in-villa massages. 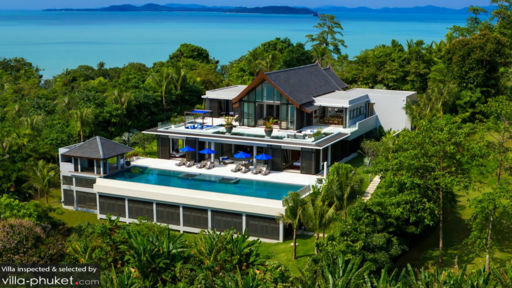 Villa Padma is located in Cape Yamu, East Phuket. It’s home to some of the island’s most luxurious properties and villas, and offers a quieter, laidback setting that appeals to couples and families. You’ll also enjoy easy access to renowned attractions like Phang Nga Bay, the islands of Koh Naka Yai and Rang Yai and the colourful Phuket Town. For nature lovers, Phang Nga Bay is an attraction not to be missed; you’ll set sight on towering limestone cliffs, enjoy kayaking and snorkeling, as well as visit unique attractions like Koh Panyi, a Muslim village built entirely on stilts. Then there’s Rang Yai Island, a popular destination where daytrippers enjoy kayaking, sunbathing, swimming and snorkeling. Phuket Town, located about 30 minutes’ drive from your villa offers a great cultural experience. Its streets are lined with beautifully preserved Sino-Portuguese buildings, with myriad temples, museums, cafes and restaurants to discover. Take a drive up Khao Rang Hill, one of the island’s most famous viewpoints to take in vistas over the town and out to the neighbouring islands. Travelling with kids? Hanuman World, Baan Teelanka and Phuket Fantasea are attractions that offer a fun family experience. A wide-ranging array of dining venues are easily within reach - between two to 15 minutes’ drive from your villa. These range from cosy cafes (Monkeypod Coffeehouse, Wooden Spoon Cafe), to seafood haunts (Bang Pae Seafood), casual restaurants (Vésu Phuket) and upscale establishments (Breeze at Cape Yamu, La Sirena). The villa is even more beautiful than on the website and everything is top quality; amazing decor and facilities. The staff are great and provide a 5 star service; nothing is too much trouble. The chef is unbelievable; menu choice is extensive, both Thai and European and the children were provided with meals to suit. Plenty to do in the area, we went to great beaches, a water park and zip lining in the jungle. 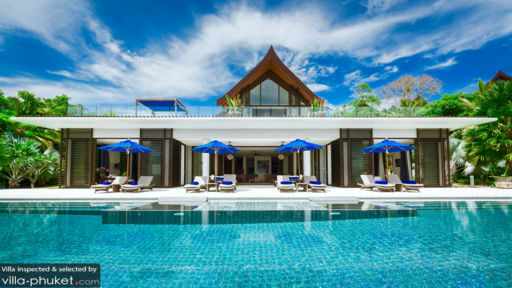 Having lived and worked in Asia for many years and travelled to Phuket on many occasions in the past we have been fortunate enough to experience some beautiful locations and wonderful service, Villa Padma however surpassed all our expectations. The facilities at the Villa are superb, the food was absolutely delicious and the service was second to none. Can we come back please! We booked Villa Padma via Awesome Villas. The agent has been very helpful and has answered my questions in detailed. The villa is simply stunning and it is very well maintained. The villa staff are very professional and attentive. We stayed there for 5 days and didn't want to leave. We don't feel the need to leave the villa at all as the food was great and we can have massages in the villa. The Sonos sound system in the villa is just amazing, you can have music any time and any where within the villa. The pool is one of the biggest among the whole Cape Yamu complex even though it's only a 4-bedroom villa. I highly recommend the villa to large groups that just want to chillax by the pool! We have been coming to Phuket for 10 years and wanted to try something away from the noise and hustle. We have 4 kids, 8-16, all hands on, action, don't stop moving, concept of reading a book - lost on them....They loved the place, pool was great, movie room, pool table etc...The house is huge so no problem for us (parents) to find a place to chill away from the kids (lasted about 10 min) If you want to leave the house (why bother) you need wheels - so take that into consideration. We made an outing of it...we missed the beach....The team was fantastic, really caring, nothing was a problem - i wanted to pack them up and bring them home!!!! Had a great time! An extended family of Grandmother, two daughters, son in law and two grandchildren (9 and 2) stayed here in June for a 40th Birthday. The villa is exactly like the pictures, so rest assured you are booking what you paid for.